I can't remember a time when I didn't read comic books. If I did, I would have to remember a time when I couldn't read. Comics were how I learned to read, a strategy my parents initially encouraged and soon came to regret. And I would read any comic I could get my hands on, especially if it had superheroes. 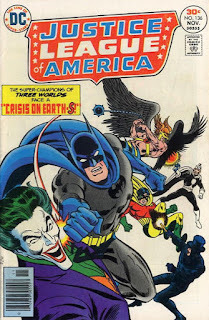 It's the vanity of every middle-aged man to think their youth was a golden age, but if you were a kid hooked on superheroes the late seventies actually was a golden age--almost literally. The fans had taken over the comics industry and were publishing Golden Age revival books like All Star Comics or The Freedom Fighters. DC had recently acquired the rights to the Fawcett characters who had once outsold Superman and, like a Roman general parading a captured rival, were sticking them into comics every chance they could get. Challenge of the Superfriends was on TV, along with The Incredible Hulk and Wonder Woman and the occasional weirdo roast where Adam West and Burt Ward came out of retirement and Mordru rode a jet ski. You could buy comics from the spinner rack at the corner store--you had no other choice, unless you wanted to pull crumpled copies out of the swap bin at the local library, which I did--and you could buy any amount of disposable, cheaply-made superhero junk from the ad pages, of which there were plenty. In hindsight, I can see that these comics were the early signs of an industry in transition from a mass market to a niche one. My comics literacy corresponded almost exactly with the DC Implosion. (I'm about 95% certain I read that Justice League comic up above, already old and no doubt inherited from somebody else, during one of the blizzards that killed DC's distribution.) The industry was shifting over to the direct market, although I wouldn't set foot in a comics shop until I was 12, just in time to get those hard-to-find issues of Crisis on Infinite Earths. I was lucky enough to come to comics at a time when it seemed like they were growing up with me. 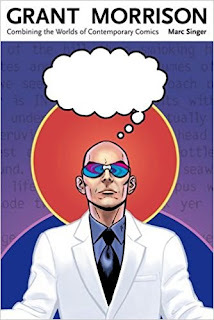 This must also be a universal delusion--those old letter columns are filled with fans who thought the same thing about the Fantastic Four, or Green Lantern/Green Arrow, or Adam Warlock, and doubtless there are many who feel it now as the comics industry expands to include new creators, new heroes, and new audiences. But when The Dark Knight Returns and Watchmen hit the stands at almost the exact time you enter your teenage years, it's hard not to feel like you're crossing a threshold together. For a while, comics--specifically superhero comics--were a pathway to maturity, a source of arcane knowledge about the world of adults. And the writers who dispensed that knowledge most arcanely, with a magician's flourish, were my heroes, for a while. Everything grew around me. When I arrived at college, there were barely enough critical studies on comics to fill a single bookshelf at my unusually well-stocked university library. When I started writing about comics myself, there was exactly one journal in the field. Now there are at least eight, and it seems like more are popping up every year. Now I'm in a position where I not only write about comics, I get to teach them as a professor of English at Howard University in Washington, DC. (I get to teach lots of other things too, from classic literature to contemporary film.) My classes on comics run the gamut from general introductions to the graphic novel to surveys of global comics to a semester-long course dedicated solely to superheroes. 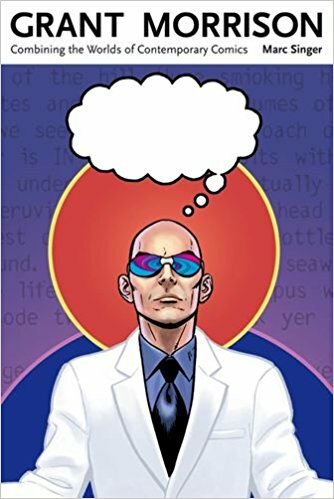 I've written a book on the comics of Grant Morrison, and I have another one about the academic discipline of comics studies that should be out sometime next year. I don't visit the local comics shop as much as I used to, and the spinner racks are long gone along with most of the corner stores, but there are more places to find comics than ever before. If I ever stop reading them, it'll probably be because I'm no longer reading. Marc Singer (born January 29, 1948) is a Canadian-born American actor best known for his roles in the Beastmaster film series, as Mike Donovan in the original 1980s TV series V, and his role in Dallas as Matt Cantrell. This isn't him, though. This is the other guy. No, not that one, the other guy.